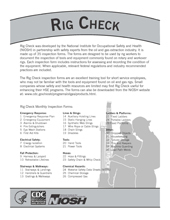 Rig Check was developed by the National Institute for Occupational Safety and Health (NIOSH) in partnership with safety experts from the oil and gas extraction industry. It is made up of 35 inspection forms. The forms are designed to be used by rig workers to document the inspection of tools and equipment commonly found on rotary and workover rigs. Each inspection form includes instructions for assessing and recording the condition of the equipment. When applicable, relevant federal regulations and industry recommended practices are included.